"A Hawaiian twist on sliders." Whisk together the lemon juice, lime juice, cider vinegar, salt and pepper in a large glass or ceramic bowl. Add the chicken and toss to evenly coat. Cover the bowl with plastic wrap, and marinate in the refrigerator for 1 hour. Remove the chicken from the marinade, and shake off excess. Discard the remaining marinade. Grill the chicken for 5 to 7 minutes each side, or until juices run clear when chicken is pierced with a fork. 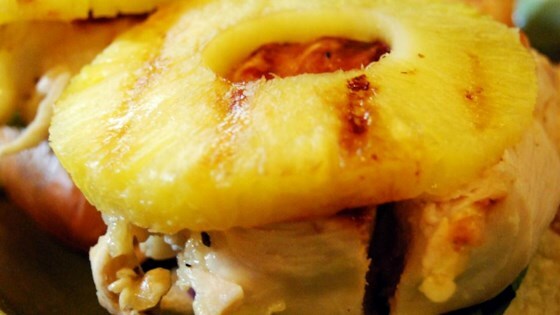 Grill pineapple for 2 to 3 minutes per side, or until heated through and grill marks appear. Spread 1 teaspoon teriyaki sauce on the bottom half of a toasted roll; next add a lettuce leaf, a piece of chicken, a pineapple round, and an onion slice. Replace the top and repeat with the remaining rolls. See how to make a tasty chicken salad using leftover grilled chicken. Excellent! We loved every bite! Found them quite filling for the portion size. We used hawaiian marinade from store and put some on our rolls too. It tastes great!! Great flavor! Grill the red onions too! Even better!